The owner of this house in Chaplefields near Coventry had bought this property as an investment and was keen to improve its appearance. 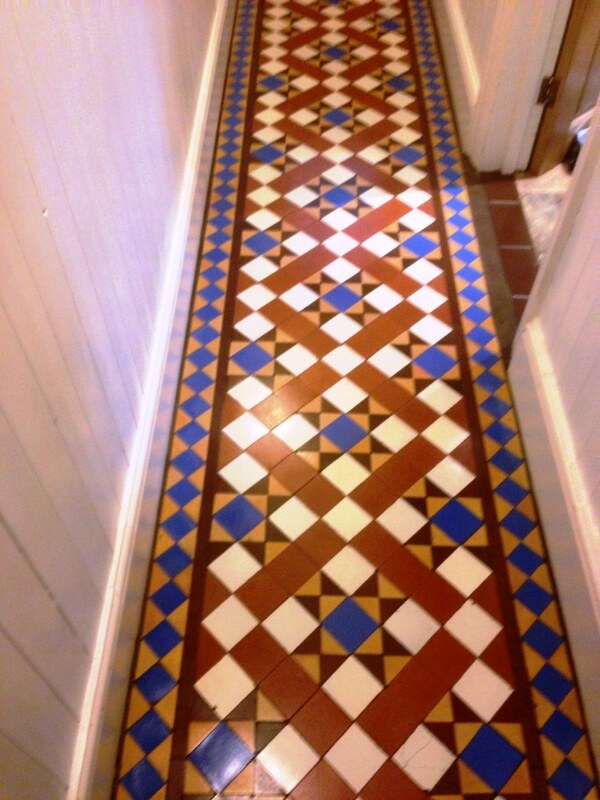 As part of this work he had lifted the vinyl tiles in the hallway and discovered a lovely Edwardian tiled floor. Unfortunately, whoever had laid the Vinyl tiles had decided to use Tar as an adhesive and this had left a black mess all over the floor. 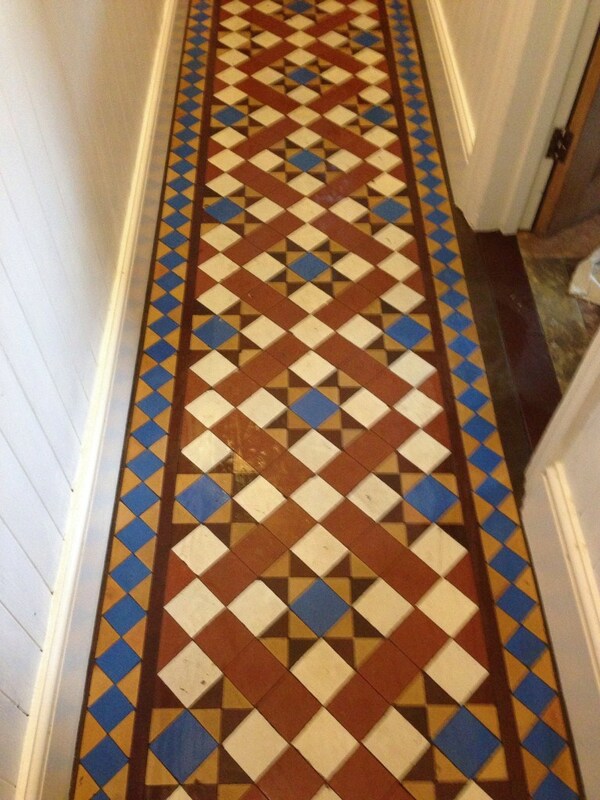 Realising the potential value an original feature such as this could add to the property he was keen to restore the tiles but not so keen to deal with the Tar, so we were asked to deal with the problem and restore the floor as close to its original condition as possible. To get the tiles clean and remove the horrible tar I applied a strong dilution of Tile Doctor Remove and Go, which as its name suggest is great for removing coverings from tiles. I applied the Remove and Go with a mop, left it to soak in for a few minutes and then worked it in using a rotary machine fitted with a black scrubbing pad. The soil was extracted off the floor using a wet and dry vacuum and then the process repeated until I was happy all the tar was gone. I then gave the tiles an acid wash using Tile Doctor Acid Gel; this serves to break down alkaline mineral deposits such as cement and grout smears, it also counters any efflorescence problems which can be an issue with these old floors where no damp proof membrane has been installed. Finally, the floor was given a rinse with clean water and a steam clean to remove any trace of cleaning products and to neutralise the tiles in preparation for sealing. 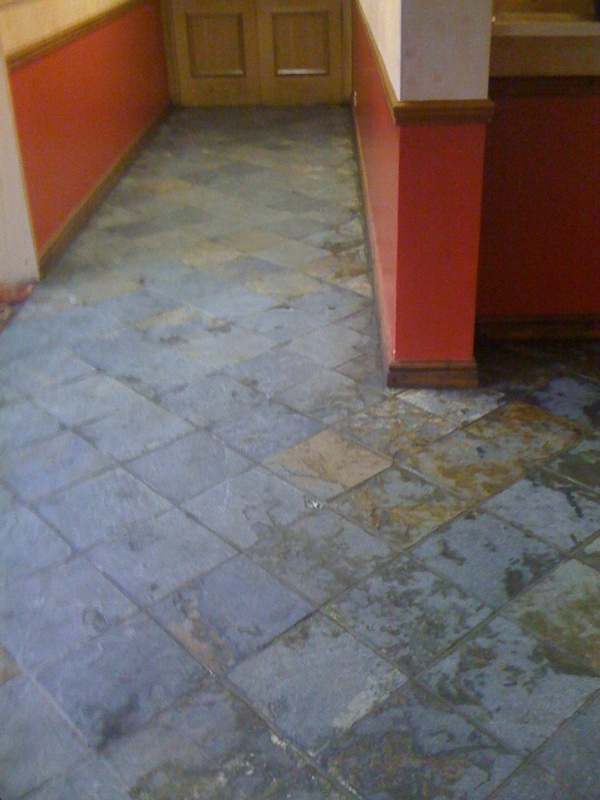 I left the floor to dry off overnight and returned to the property to seal the tiles the next day. To seal the tiles, I used three coats of Tile Doctor Seal and Go which is a water based sealer that leaves a subtle sheen finish and being water based doesn’t leave a smell as it dries. The sealer will provide durable protection going forward preventing dirt from becoming ingrained into the pores of the tile and ensuring it remains easy to clean and keeping its appearance for some time to come. The floor now looks fantastic and gives a great impression when you come into the property which is exactly what the owner wanted. 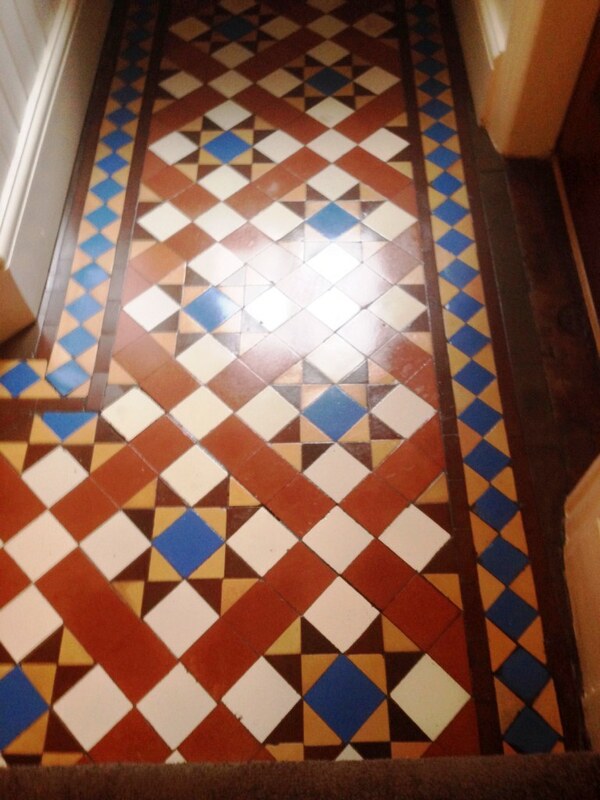 This was a straight forward request to clean and re-seal a Victorian Minton tiled floor in Coventry. 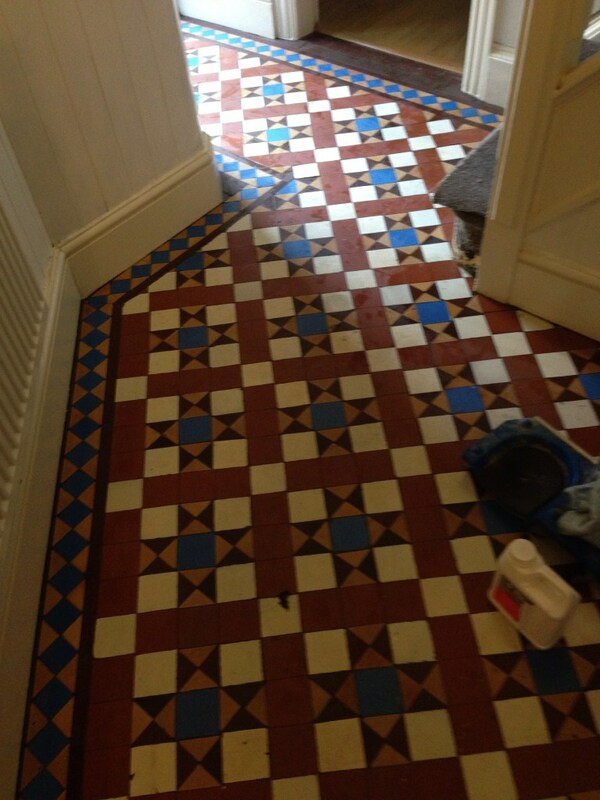 The tiles were in good condition but there were a few stubborn stains that needed dealing with. I used a concentrated dilution of Tile Doctor Pro-Clean to clean and strip the old sealer from the floor. 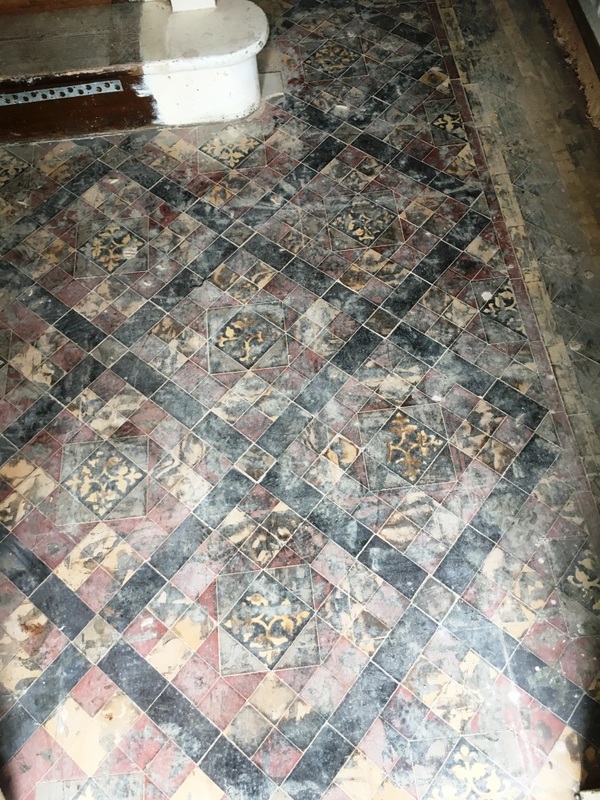 It was first left to soak into the tiles for around 15 minutes before being scrubbed into the Victorian tile and grout using a slow speed rotary machine fitted with a scrubbing pad. The dirty solution was removed and the process repeated and grout lines scrubbed until I was happy the tiles were clean; this was then followed with a thorough rinse with water and a wet vacuum was used to remove the fluids and get the tile and grout as dry as possible. This process took most of the day so once the floor was clean I left for the day leaving it to dry overnight. I came back the next day and after confirming the tiles had dried I began sealing them using six coats of Tile Doctor Seal and Go sealer which will provide stain protection as well as adding a nice shine to the floor. The interesting thing about Seal and Go is that’s it’s a water based sealer so you don’t get a smell as it dries. 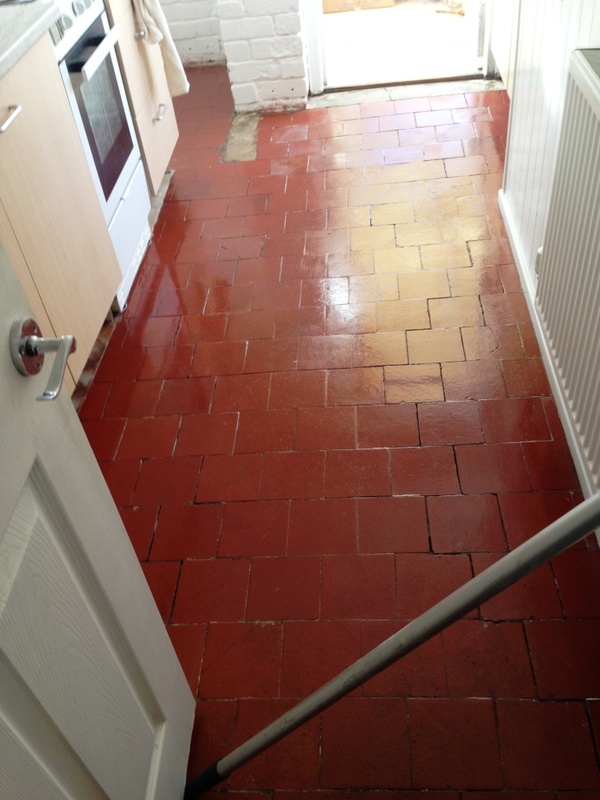 This Limestone Tiled Floor was installed in the hall and kitchen of a residence in Coventry. 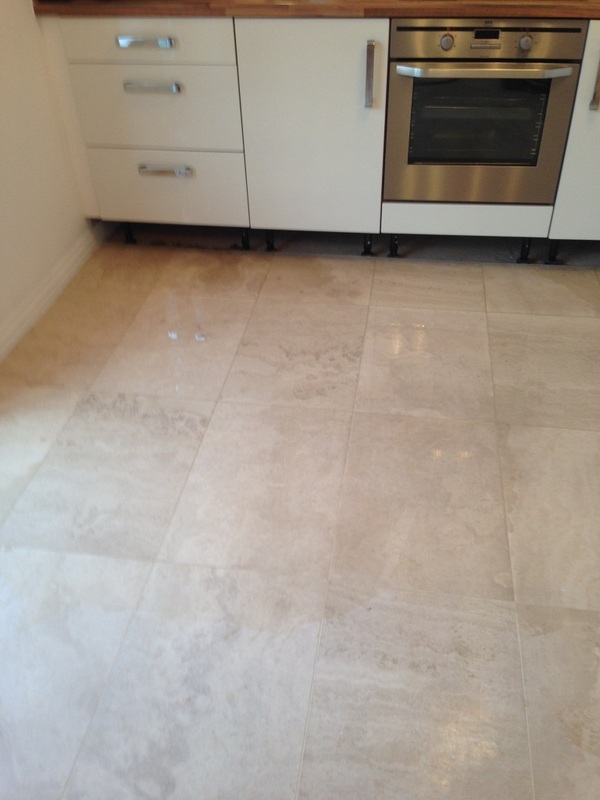 The floor had scratch damage in the middle of the kitchen and was dull from the previous use of the wrong cleaning products, the house had recently been sold and the new owners wanted the damage removed and Limestone sealed and polished so it looked new again. The first task was to give the floor a general clean using a dilution Tile Doctor Pro-Clean with the focus on the ensuring the grout lines were given a good scrub to get them looking clean again. The dirty solution was then removed from the floor using a wet vacuum and rinsed with clean water. Limestone like Marble and Granite is a very hard stone and needs to be cutback with burnishing pads to get it looking good again; the pads fit a rotary buffing machine and applied with a little water. Tile Doctor supplies a four pad Burnishing set for this purpose and you start off using a coarse pad to cut back the dirt from the floor and then move through the pads until you get to the last one which is very fine and polishes up the stone. To protect the floor it was sealed with two coats of Tile Doctor Colour Grow which is designed to lift the natural colours in the stone and will protect the tile from stains in future. 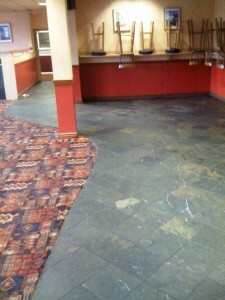 In total the floor took eight hours to clean and re-polish, the scratch was gone and the floor now looks new again, just what the customer wanted. 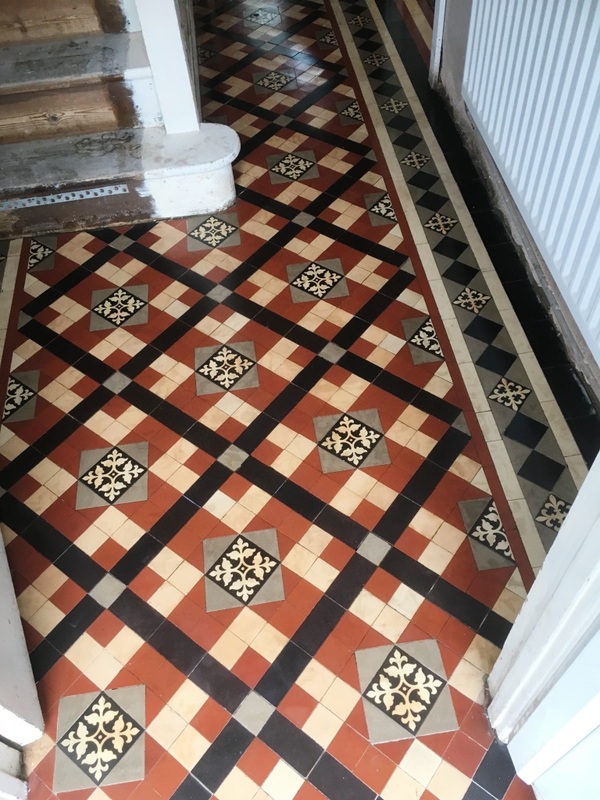 These Quarry tiles were in the kitchen of a house in Coundon, Coventry; the owner of the house found them hidden under a carpet and was keen to restore them. You can see from the photograph below they had been seriously neglected, covered in paint and cement and then finally carpet adhesive. 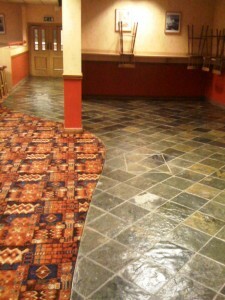 First the quarry tiled floor was dry vacuumed to remove loose soil and particles from the surface. 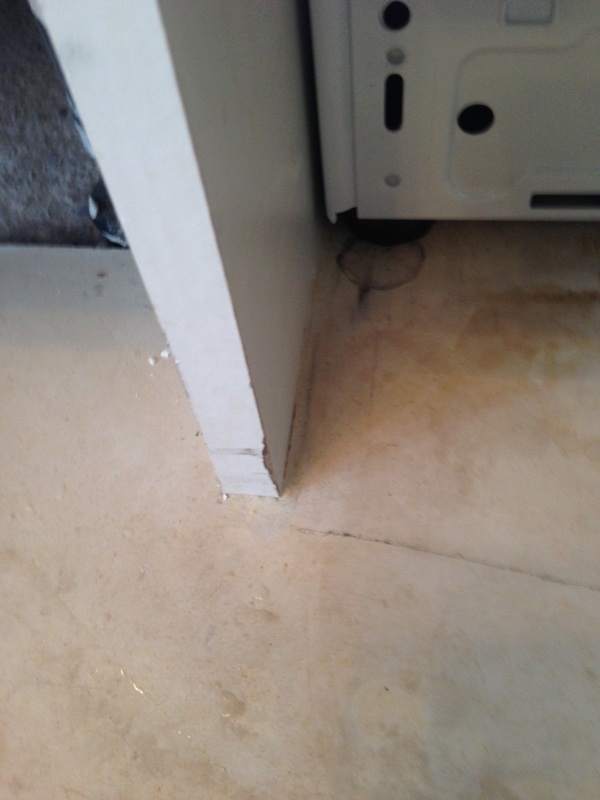 It was then cleaned using Tile Doctor Grout Clean-Up which is an acid based product useful for the removal of grout from the surface of the tile and in this case cement. 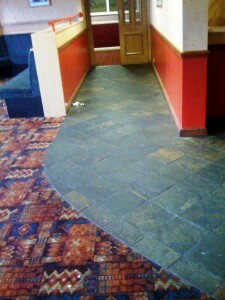 The solution was worked into the tile using a buffing machine fitted with a black scrubbing pad. The soiled solution was removed using a wet vacuum and then rinsed with water; the process had to be repeated a second time before we were happy with the result. 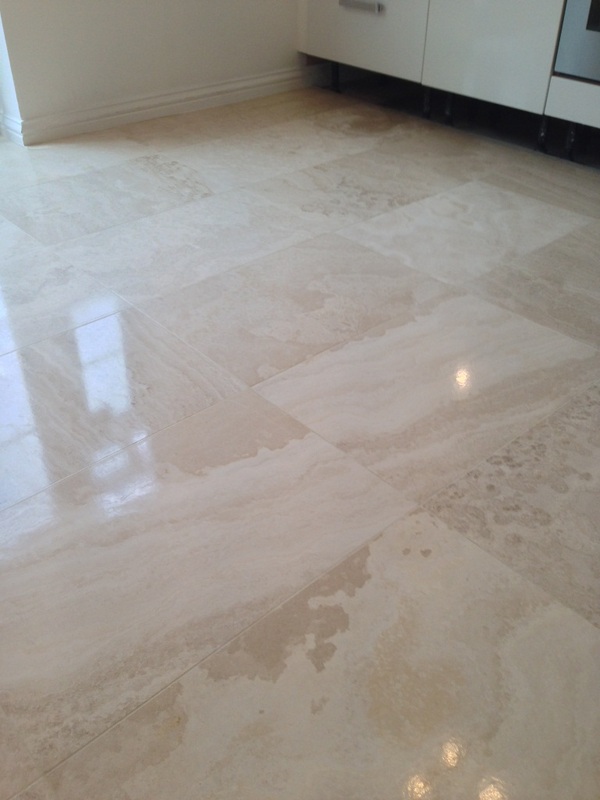 The next step in the cleaning process was to use a powerful industrial steam cleaner on the surface of the quarry tiles, as well as cleaning the steam had the added advantage of neutralising the floor before sealing. The floor was now clean and the hot steam soon evaporated so it wasn’t long before we set about sealing the Quarry Tiles with four coats for Tile Doctor Seal and Go which combines stain resistance with a durable low-sheen finish. Called out to a factory floor in Aldermans Green Industrial Estate, Coventry in the West Midlands to clean and degrease the floor prior to keys being handed back to the local council .The floor also need to be repainted with epoxy floor paint but had to be clean first, we were happy to offer both services, i.e. cleaning and repainting. The floor was cleaned using Tile Doctor Pro-Clean diluted 1 to 5 with water and an additional 100ml of Tile Doctor Remove and Go to help strip cut the grease. The solution was mopped onto the floor and left to dwell for 10 minutes before being scrubbed with a buffing machine fitted with a black scrubbing pad. The soiled water was removed with a wet and dry vacuum, we tackled the floor tape with a steamer and solvents before a final high pressure rinse with water. 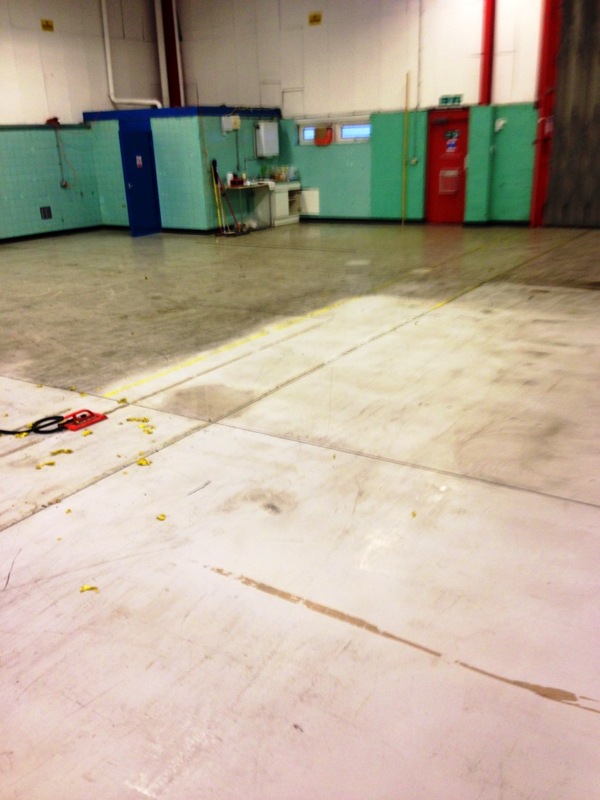 Factory floor degrease in progress at he Aldermans Green Industrial Estate, Coventry. The picture above shows cleaning being done and tape removed, in total it took a total of 22 hours over 2 long days. 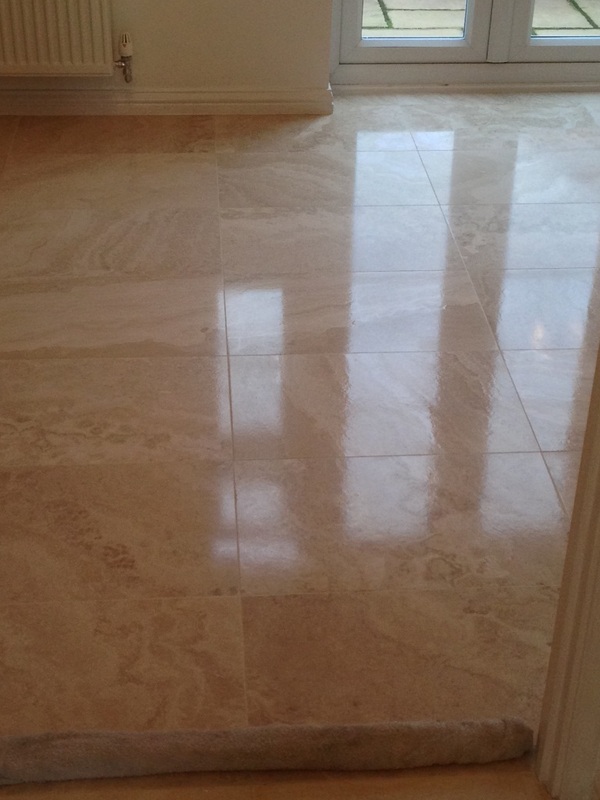 Great photograph below of a Limestone floor in the kitchen of a house near Coventry. The Limestone had lost it’s shine after the application of a surface sealing “Clean and Shine” type product; the problem was akin to the application of a wax finish which in turn had been contaminated with cleaning product and soil underneath. The grout line has also become heavily soiled through everyday use. 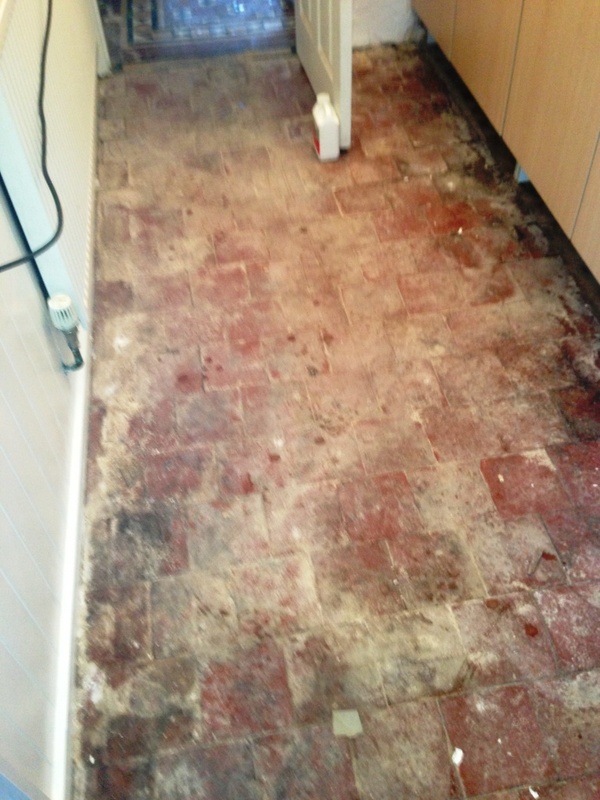 First the Limestone tiled floor was dry vacuumed to remove loose grit; we also took to opportunity to remove the kitchen unit kick boards. This was followed by a good clean with a 1:5 mix of Tile Doctor Pro-Clean which was left to dwell for 15 minutes before the application of a stiff grout brush on on the grout lines followed by the use of a slow speed buffing machine to break up the surface wax on the tile. The whole are was rinsed down using high pressure clean water via a spinner tool which removed any left over dirt from the grout lines. 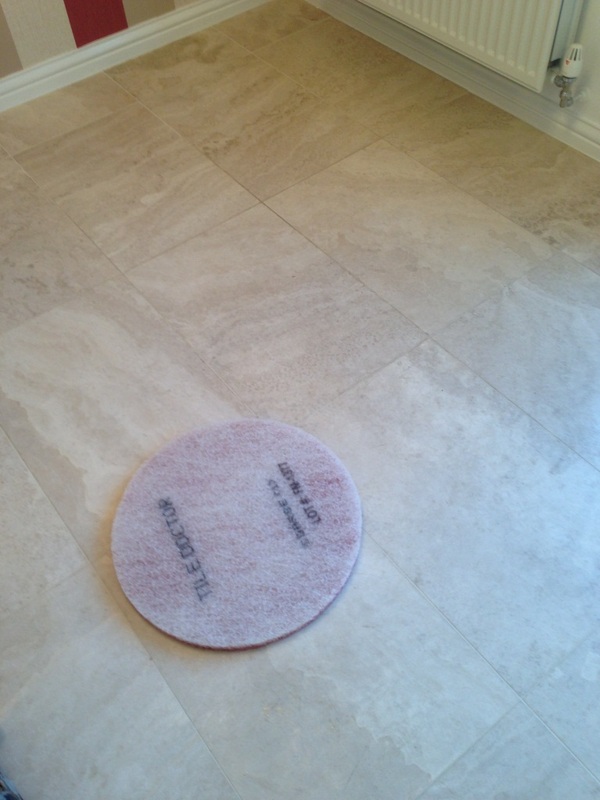 The next step was to use the diamond encrusted burnishing pads system to prepare and condition the limestone floor tiles prior to polishing. We then applied Tile Doctor Shine Powder using a White buffing pad to provide that extra deep shine you can see in the photograph, it also provides and tough durable finish. 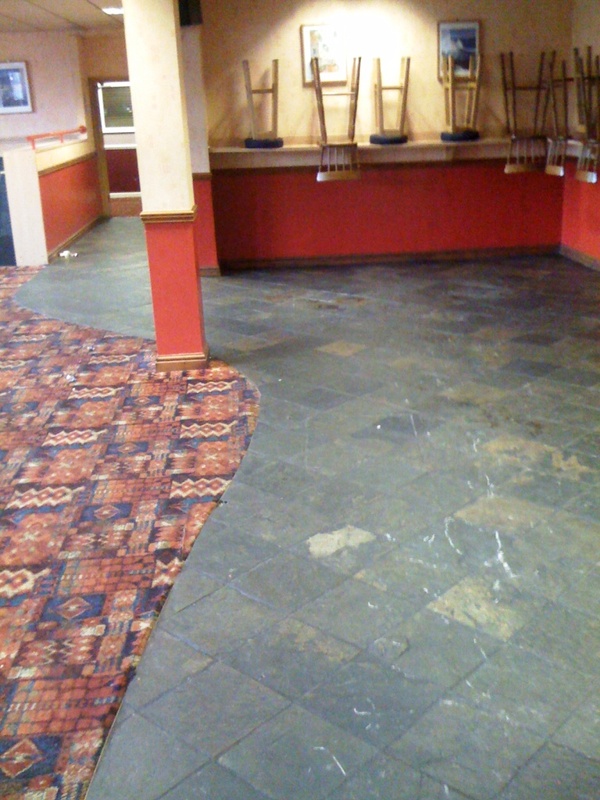 It’s often difficult for a set of photographs to capture the difference cleaning and sealing a stone floor can make, however I think you will agree the photographs below which were taken at the Standard Triumph working men’s club in Coventry show an amazing transformation. 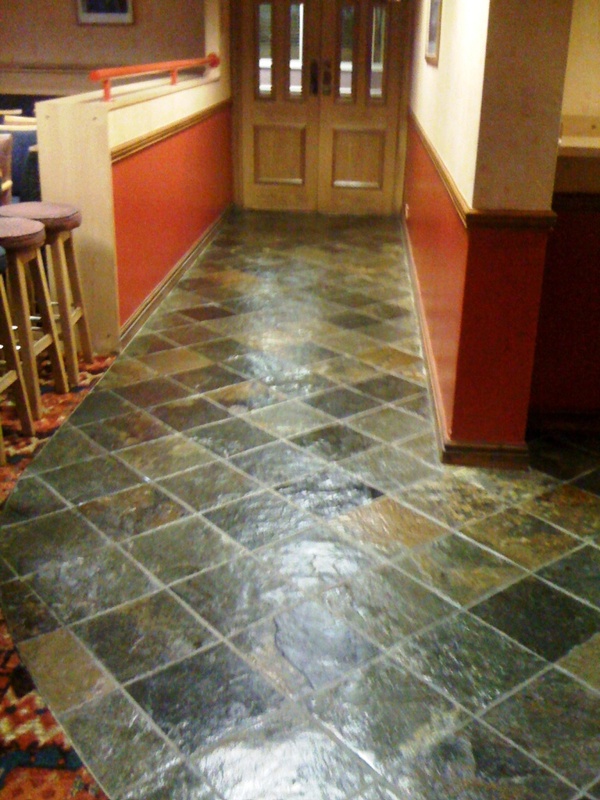 The slate floor had one coat of sealer put down by the tiler some ten years ago and due to the nature of the environment it had been covered in drink spills and the resulting cleaning products, overtime this had made floor sticky and dull. The first step in the Slate Tile Cleaning process was to get it completely clean and free of any residual chemicals, we did this with the application of Tile Doctor Pro-Clean (a strong 1/2 mix with water) which we left to dwell for 15 to 20 minutes allowing it to chemically soak into pores of the slate tile. 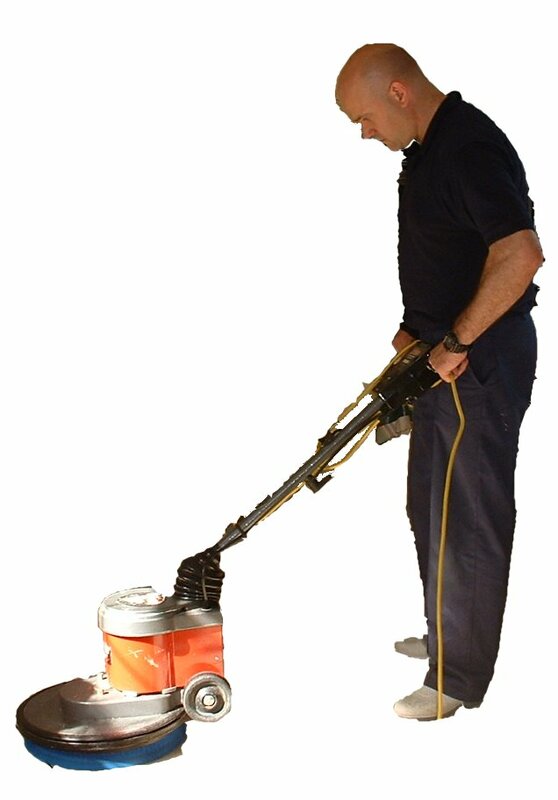 We then scrubbed the floor with a heavy weight floor buffer allowing the scrubbing action to break the soil down, we worked the soil and grout lines four square metres at a time, removing the soiled water with a wet and dry vacuum. The slate floor was then washed down with cold water applied at a pressure or 1200 psi with a special Spinner Tool. 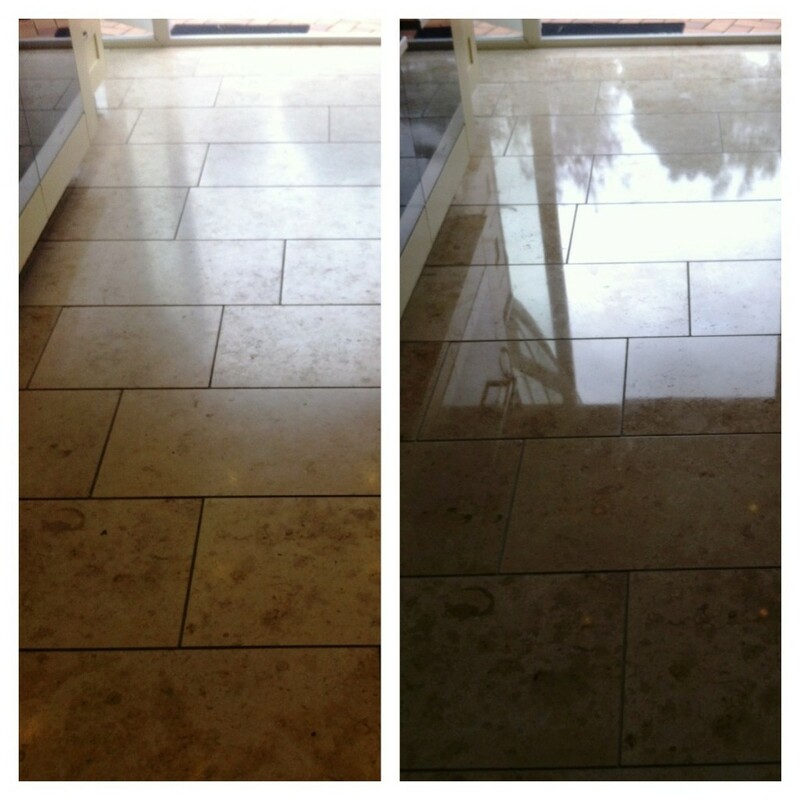 The whole tile cleaning process took around 8 hours to complete. An inspection of the cleaned slate floor revealed ten years of wear and tear had resulted in a few holes which we repaired before leaving the floor to fully dry overnight. The next day we coated the floor with 5 coats of a Tile Doctor Seal and Go which is a water based sealer ideal for Slate floors that provides stain resistance and a durable low-sheen finish. 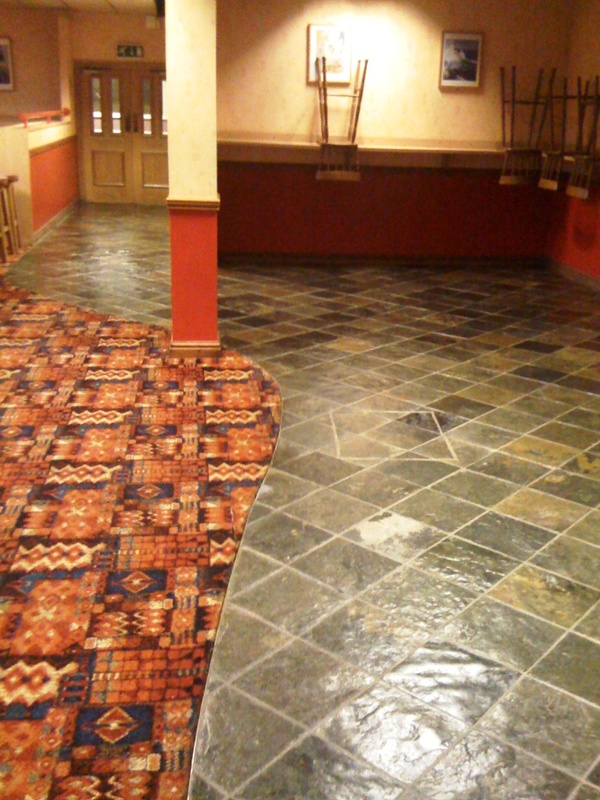 Sealers do break down over time and given the high foot traffic over this floor we have agreed to go back once a year to provide a tile cleaning and sealer top up.